While round and emerald are the two most widely known and thought of shapes for diamonds placed in jewelry, over the years jewelers have perfected the art of diamond cutting and have mastered a wider array of shapes. Every diamond is unique. The original stones structure dictates how the jeweler is able to cut. Even though shape is not one of the much discussed 4C’s (cut, clarity, color, and carat) it is still one of the most important factors as the cut is what determines light reflection and brilliance. 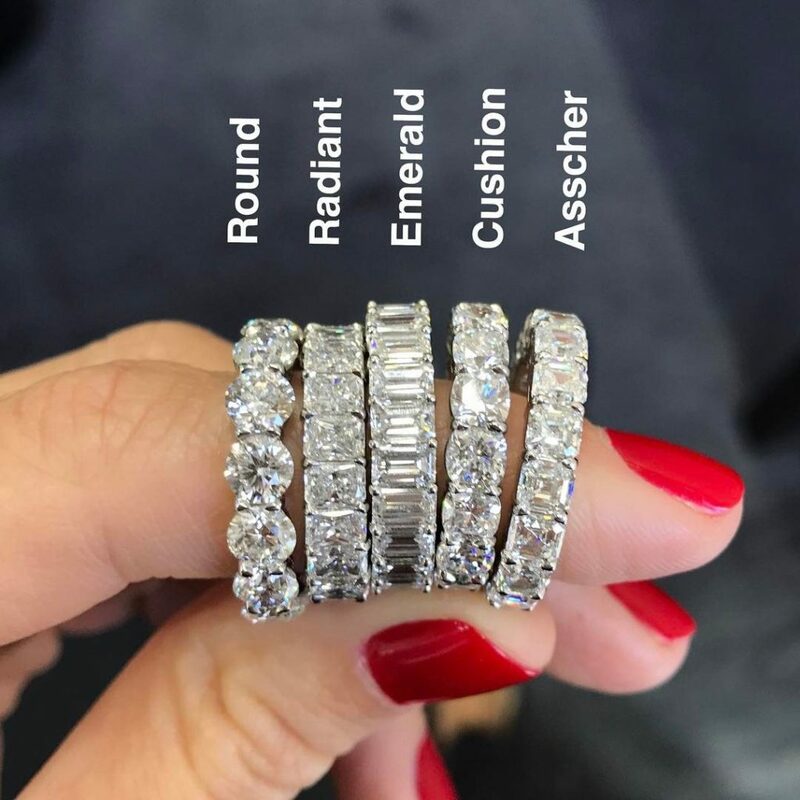 Choosing your diamond may feel overwhelming when it comes to choosing a special piece for yourself or a loved one, but knowledge makes it easier. Let’s take a look at the cuts that are available and see what you are most drawn to. Round – Round Brilliant Cut is the most sought out shape of all cuts. With a round diamond the higher the grades in the 4C categories, the more sparkle you will get. Princess Cut – Princess cut diamonds may be either rectangular or square (square being the more common), this cut displays amazing color in the corners as well as the face. Marquise Cut – This is the best cut to maximize carat weight by emphasizing the size of the diamonds. This interesting shape is great for slender fingers and hands. Cushion Cut / Pillow Shape – known for impeccable brilliance and clarity due to the rounded corners and enlarged facets. Emerald Cut – Because of the larger table face it makes the inclusions and color more easily viewed. The facet step cut also ads to the brilliance. Radiant Cut – The name says it all. The radiance of a round diamond with the beautifully cut edges of an emerald cut. This is a great diamond to use in compilation pieces. Pear Shape Cut – A pear is a combination of marquis and round making a tear shaped diamond. It creates a delicate soft look. When buying a pear shaped diamond symmetry is very important to look for. Oval Cut – Oval diamonds are very popular for engagement rings. They offer incredible brilliance similar to the round cut. Asscher Cut – This cut is very often mistaken for an emerald diamond. Asscher’s are square rather than elongated but other than that the actual cuts are very similar. At First Pawn we have an ever changing stunning selection of diamond rings, diamond necklaces, diamond bracelets, and even watches with diamonds in the design. Simply said, we love our diamonds. We offer them to you at just a fraction of retail prices… so come on in and take a look before heading off to the local retail jewelry shops. You might be pleasantly surprised at what you may find!